Tom Edwards won the Rookery Waters �1,000 grand final. A wet and very windy River Trent greeted anglers from across the country fishing Saturday’s Division One National. This is still regarded by many team anglers as the blue ribbon event but unfortunately the result did little to encourage anyone to take up team fishing on a regular basis as some of the country’s best anglers were reduced to unbelievable tactics just to get a fish for precious points. Ian Benton won the Tydd Gote Mega Match final. Drennan Barnsley comfortably took the team title with 380 points, but we have to congratulate Huntingdon-based Browning Hotrods for their fine effort, coming in sixth with 314 points. It wasn’t such good news from the Sensas Mark One camp though. Some poor pegs on the day saw them finish in 20th place. Peterborough & District AA ran a practice match for those fishing this weekend’s Riverfest Qualifier. Despite the conditions and a fair amount of weed growth there were some very respectable weights taken. Out in front from the Orton downstream section was Grant Howie with 20lb 3oz of skimmers and roach. 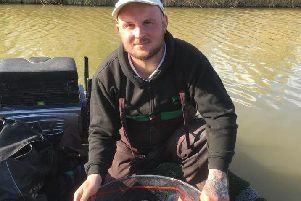 Runner-up was Martin Caldicote from the same area with 16lb 15oz. The club have put a lot of time and effort into clearing the pegs of weed but as usual it’s going to be a never ending and thankless task. However, there are lots of fish to be caught and given the right conditions we should see a good result for the club and those taking part. High winds were also a problem for those fishing the £1,000 two-day final at Rookery Waters. Two good draws and some fine fishing ensured Tom Edwards took the honours. Day one saw Edwards drawn on Jay Lake peg 13 and he caught well on the feeder with luncheon meat for 100lb 6oz and a vital section win. Day two saw him switch onto the Magpie Pool peg 31 and yet another section win gave him a perfect two point score. As others had the same number of points his weight of 280lb 14oz sealed the victory. Josh Pace came close, again with a two point score, but had to settle for the runner-up spot with a weight of 267lb 2oz. Third place with two points and a weight of 217lb 12oz was Barry Mason. Another big match at the weekend was the final of the Tydd Gote Mega match, for which anglers qualified from a series of club matches. So there was a strong line-up on the North Level Drain on Sunday prepared to do battle. Leading the way with a massive net of bream from peg 14 on the Main Road section was Ian Benton. He caught steadily all day catching all of his fish on a groundbait feeder to weigh in 65lb 8oz. Runner-up was Chris Lynn. He fished the pole on peg two and caught a net of roach and skimmers together with a bonus bream for 13lb 14oz. Third place went to John Taylor on 9lb 13oz. Series and match organiser John Bates was very pleased with the event and is confident it will be bigger and better in 2017.